Many of the slower tracks, without the guitar pyrotechnics, are closer to a traditional country style norm and just seem less exciting than the up-tempo numbers but they are solid. Scott is an excellent guitarist and fine vocalist and is accompanied by a tight band including bassist Rob Crozier, drummer Will Osler, keyboard/accordion player Steve Mullans, dobro & pedal steel guitarist John Lang, and fiddle/mandolin/banjo player David Mosher. He also is able to write his own music and lyrics, which is a distinct advantage in the music industry. 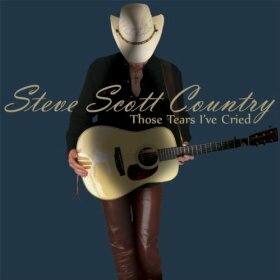 Steve Scott’s Those Tears I’ve Cried deserves some attention as it contains some good music that crosses over from a traditional country sound in an interesting way.